On Wednesday, March 23rd, Franconia Conference hosted an appreciation luncheon for the Conference’s 19 Conference Related Ministries (CRMs). 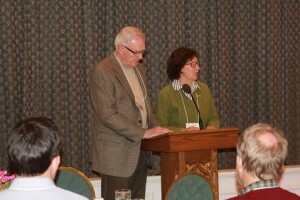 Representatives from the organizations enjoyed lunch in the Fisher Auditorium at Dock Woods, part of Living Branches. Welcome remarks were given by Ertell Whigham, conference executive minister. John Goshow, conference moderator, reflected on his time as a leader at Penn Foundation, a CRM, and offered his perspective now from a conference stand point, highlighting all the CRMs offer to the conference and conference congregations. It was noted that through the CRMs, well over 50,000 people are reached annually. 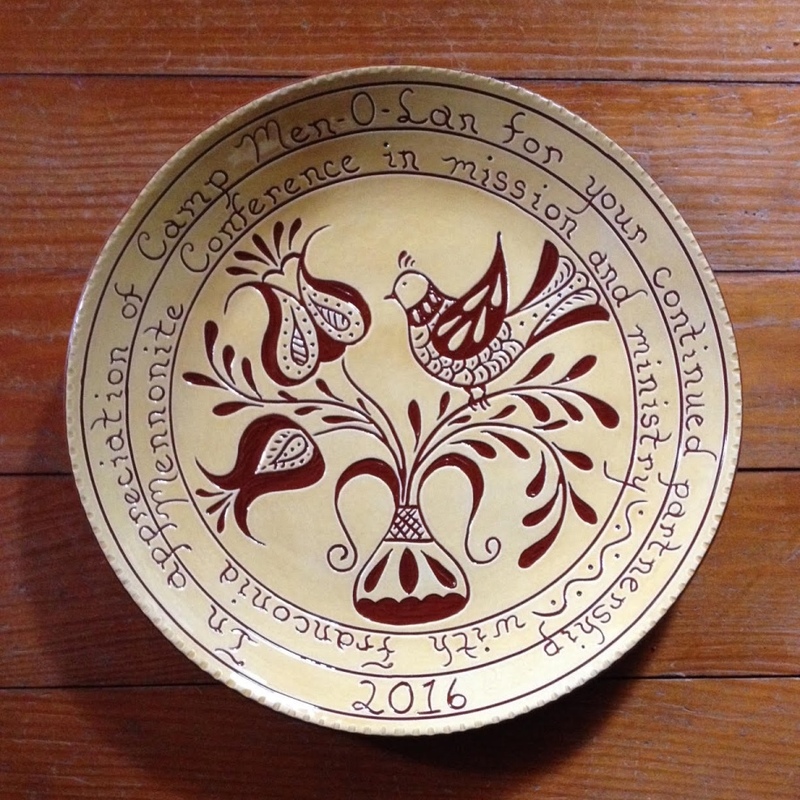 As a token of appreciation, each CRM was gifted by the conference a Pennsylvania Redware plate handcrafted by Denise Wilz and customized with the CRM’s name. 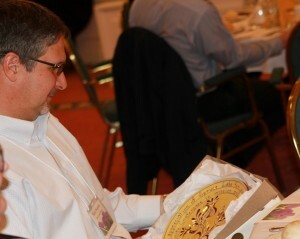 In addition, Mim Book and Jim Lapp, credentialed leaders within Franconia Conference offered a blessing over the CRMs. 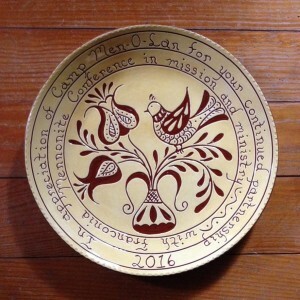 To learn more about who the Conference Related Ministries and how you and your congregation can get involved with them, visit http://franconiaconference.org/directory/conference-related-ministries/. It is an honor to be with you today and to offer a blessing for you in your varied ministries in behalf of our conference and congregations. Thank you for the important service you each provide that enriches the body of Christ in such diverse ways. Please pray with us. Gracious God, you have blessed your church with a rich abundance of gifts for service through these sisters and brothers, and the boards, leaders and staff in each of these ministries. We praise you for the women and men with vision who gave pioneering leadership these past 100 years to bring into existence these many forms of service that extend the mission of our congregations. We give thanks for those who contributed their finances and time, often sacrificially, for the good of children, youth, older people, those with disabilities, those well and not well, the newly born and those dying, the incarcerated, and those with physical and mental illnesses. We are grateful for those who brought business experience and wisdom to their leadership as they invested their gifts and resources in these creative ways. We thank you for pastors and church leaders who offered spiritual insight and wisdom to help make these ministries flourish. We now pray your blessing upon those who give leadership to our camps and retreat centers – Bethany Birches in Vermont, Camp Men-O-Lan, and Spruce Lake. We pray that in each setting the spirit of Christ would infuse those who serve with love, and transform all the participants in these ministries. We pray your power and blessing on our schools – The City School, Quakertown Christian, Penn View and Christopher Dock high school. May the administration, faculty and boards of directors serve with clarity of purpose and conviction in the nurture and formation of our children and youth. We pray grace upon all who serve with the Indian Creek Foundation and Peaceful Living who provide opportunities and care for those with special challenges in life. May each one be treated with dignity, compassion and love. We pray your gracious presence upon all who serve with the Penn Foundation and Liberty Ministries. Let your healing mercy and love shine through the staff and contribute growth and stability to those who too often are stigmatized in our society. We pray for those who lead us in gathering and managing historical resources through the Germantown Historic Trust and the Mennonite Historians of Eastern Pennsylvania. Through these ministries may the faith of our ancestors continue to enrich and guide our churches in the 21st century. We pray your continued strength on the ministries of the Care and Share Shoppes and the MCC Material Resource Center and all who lead and volunteer in these ministries. Bless these labors of love and sharing as a means of ministering in the name of Christ to those local and global who experience special needs. We pray the Delaware Valley MEDA, the Eastern PA Mennonite Disaster Service, and Life with God program will continue to offer resources that touch the spiritual and physical needs of people with the hope and peace of Christ. We pray for all our ministries that serve the aging – Living Branches on its various campuses, and the Community at Rockhill. We pray the staff, administrators, chaplains, and boards of directors will have wisdom to foster communities of healing and peace, with respect for the spirituals sages who reside there, and for those with limited family and other resources. Our God, we also ask your Divine blessing on our conference leaders who seek to show support and encouragement to those in these ministries.